A recent post in Rooflines by Alan Mallach entitled “5 Things Cities and CDCs Don’t Get About Code Enforcement” makes a pointed argument that two key players in the future of urban neighborhoods, namely city agencies and community development corporations, are overlooking housing code enforcement as an important and existing tool of community development that can stabilize and improve neighborhoods. A program I've been working on called HousingCheckup has the potential to reform the way housing code enforcement is conducted to address some of the current challenges Mallach discusses. It will provide open access to a property’s complete health history, including landlord information, current code violations, and past health and safety inspections. It will be the first web application that aggregates regulatory and legal data from city agencies, allowing users to access the complete housing health history for either a property or a landlord. The program was recently chosen as one of semifinalists among 880 submissions in The Knight Foundation's 2013 Knight News Challenge under the theme “open government.” The challenge has drawn an incredible outpouring of interest from those who want to hold the government accountable and who believe that the government can be more efficient with better tools and public engagement. HousingCheckup is a next-generation approach to community development that recognizes the potential of the private sector to provide high quality housing, reinforces the public sector’s efficient enforcement of this outcome, and enables the effective engagement of tenants and housing advocates in the solution. It leverages the evolving push for open government data standards to provide a solution that will ultimately make the public sector more efficient by opening up the ability for tenants and housing advocates, landlords, investors and others to cooperatively address housing code enforcement problems. Mallach says “most private property owners, in most neighborhoods, can be motivated to keep up their properties”; HousingCheckup makes it easier to involve neighborhood organizations and CDCs in providing that motivation. According to the National Center for Healthy Housing, nearly six million families in the U.S. live in substandard housing. The reality is that no single entity, even the most prolific community development corporation or the largest distressed property vulture funds that have swooped in to purchase large portfolios of single family housing, is likely to control more than a fraction of its neighborhood’s housing stock. HousingCheckup will use open government data to enable all the stakeholders in healthy housing to work together, work effectively and work efficiently. It promotes a national open standard for housing data and will allow the use of these data and the platform in ways that we can predict, and in ways that will be unexpected. Schools, for one, could use the program to assess if students' grades are affected by their physical home environment. Code enforcement departments in many cities are understaffed and overworked, leading to a pattern of simply treating “code enforcement as a process of responding to complaints, with a set of one-size-fits-all responses, instead of a proactive approach,” as Mallach writes. And while tenant advocates are an important part of the healthy housing equation, tenants themselves are truly the stakeholders who have to take the first steps because they live with housing code issues every day. But who else is in every neighborhood every day? Who else visits every house on a regular basis and who might notice changes for the better or worse? In an April 2 Washington Examiner column Harry Jaffe describes how government workers who already tour cities on a regular basis could be part o f code enforcement. Take, for example, the 4.3 million miles driven by United States Postal Service each day as approximately 300,000 letter carriers walk and the over 212,000 postal vehicle of drive every residential street in every community on a nearly daily basis. 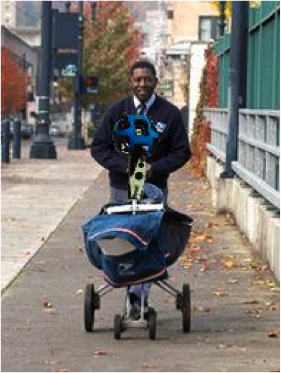 What if every postal delivery cart and vehicle was equipped with so-called street view cameras like the ones Google uses? The USPS could offer a daily updated street and it could be integrated into HousingCheckup to create a national and almost real-time blight status network. Visual pattern recognition algorithms could be developed to spot paint hazards based on the housing age and other data available through HousingCheckup. Jeremy, my city refuses to in force code violations could I talk to you?